I wish I'd seen Superbrothers: Sword & Sworcery EP for the iPhone/iPod Touch at the start of last week's Game Developers Conference, instead of at the end, so that I could better answer the event's most commonly asked question. It's the best response to the frequent smalltalk question "So, did you see anything cool at the show? ", a beautifully saturnine and laid back exploration experience that elicits memories of Shadow of the Colossus, The Legend of Zelda and, at times, Punch-Out!! Superbrothers: Sword & Sworcery EP is the product of a collaboration between: artist Craig D. Adams, responsible for the game's gorgeously-animated, anorexic, and IGF Mobile Achievement In Art award-winning pixel visuals; Jim Guthrie, the music man; and developer Capy, also showing Might & Magic: Clash of Heroes HD at GDC. The level we played at GDC, Adams says, is analogous to the tram ride in the original Half-Life. The first "track" of the Sword & Sworcery EP gets the player's feet wet with the touchscreen controls, Phantom Hourglass-like in that the player only need tap the screen to guide the sword-wielding Scythian. Players will soak up the aesthetic, learn to look, listen and observe, and follow the Grizzled Boor through a wooded twilight. Eventually, players will come in contact with the Boor, then fight, Punch-Out!! style, switching from horizontally oriented adventure mode to vertically oriented battle mode. Boor at the top of the screen, Scythian at the bottom, players will tap a circle on screen to attack at the right time, tap a darkened corner to dodge. Eventually, players have the option of killing the Grizzled Boor. I did and Adams jokingly chided me for slaying the beast, implying that there may have been other outcomes to the fight. The opening level then lead into a teaser for the next area, featuring a black wolf against a rising sun, a new adventure for the Scythian. While the opening level felt mostly linear in its path to the Boor, there were a few detours to take, as well as a secret visual trick that I missed until Adams pointed it out. That literal question mark, reflected in the water of a lake that the Scythian walked across, opens up to something later on, just one of many encouragements for additional playthroughs of Sword & Sworcery EP. Superbrothers: Sword & Sworcery EP is one of the more enticing iPhone games to come this year, in part due to its smart, stylized visuals and ever-building soundtrack from musician Jim Guthrie. The game is due to come to the iPhone and iPod Touch in the second quarter of 2010, but here's a video walkthrough of the initial level, the same shown at GDC. 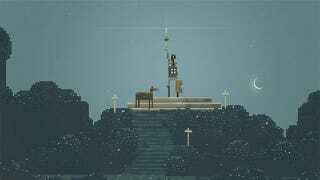 To see more of Superbrothers' work and Sword & Sworcery EP gameplay videos, make your way to the official project site.